(Newser) – It may not be an encouraging sign for Greece's financial affairs, but the country's brand-new finance minister is resigning, Bloomberg reports. 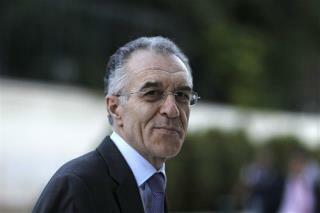 Prime Minister Antonis Samaras accepted Vassilis Rapanos' resignation today, according to a text message from the premier’s office. Rapanos had just been named the new minister last week, but was hospitalized Friday after collapsing. The AP reports that he's still in the hospital with abdominal pain, dizziness, and nausea, but will be released tomorrow.